…And oh, what an adventure it’s been. Before I get to that, anyone get the reference in the title? Anyone? If you do, (hint: it helps to be a fan of late 80s movies), I’ll be so impressed. Now on to the journalism…Brace yourself guys, this is going to be a long one. The description of events are mostly for me to remember and to inform family and friends, but I’ll throw in my journalistic musings in the next post. Driving along US 60 from Poplar Bluff to Sikeston. Notice how close the water is on both sides of the road. Parts of this highway were closed throughout the rest of the night. I know it’s going to be an interesting day when my editor calls and asks what my day looks like. As it so happened, when she called on Tuesday afternoon I had a completely free, albeit with one class, Wednesday ahead of me. Before I knew it, I had agreed to go down to Poplar Bluff and check out the flood situation that has been plaguing it and southeast Missouri for the last few days. That’s right, floods. And LOTS of them. Drew, another reporter, and I headed down at 7 a.m. Wednesday to Poplar Bluff, a town about 4.5 hours southeast of Columbia. We were charged with see what was going on flood-wise and also checking in with the 175th Military Police Battalion from Columbia, which is apart of the Missouri National Guard. After an car ride where we nervously discussed what we may find, we roll into town. As soon as we got our bearings on the main drag in Poplar Bluff, we found out the 175th is changing locations to a National Guard Armory an hour away. We also heard that Missouri Senator Claire McCaskill was coming down, and we needed to find out where she was being briefed and get there. To give you guys some perspective, we had almost zero plans for this trip. We knew we needed to get information, but we didn’t know how or where. The last thing we wanted to do was stay still. So we headed to the National Guard HQ in Poplar Bluff, where we found out they were picking up the senator from the police station. We still didn’t know if the briefing was public at this point, so we raced over to the police station to try to catch them (Shout out to Drew for being able to follow my somewhat disjointed directions whilst driving). The Red Cross, though efficient and organized, is a real obstacle to curious journalists. Drew and I stood around for a few minutes before we just went at it and found people to talk to. Between the two of us we heard stories of homelessness, disability, fear for losing jobs, and volunteer efforts. It’s truly amazing what people can go through. I can’t imagine being in a position where I don’t know if my house is livable, or if I will have a job when I return. The shelter itself was impressive. Walmart made huge donations of toys and food, and other agencies sent in supplies for pets. A church group ran the meals, and donations were so plentiful that the shelter had to get a separate building, and eventually, turn them away. All I heard from people all day was how generous and giving the community was. When we left the shelter, we were faced with the decision of whether to go follow the National Guard to where they relocated in Sikeston or stay in Poplar Bluff. After driving around discussing this during a tornado warning, many hurried conversations with our editor and some quick decision-making, we decided to go on to Sikeston. We agreed there still could be a story in Poplar Bluff, but our news peg was the 175th Battalion from Columbia, and they moved to Sikeston to set up shop. Our first meal of the day occured at about 3 p.m. at a Sonic that was being pelted by rain. We drove to Sikeston and scarfed down our burgers. We found out later Poplar Bluff saw bad weather and hail shortly after we left. Good timing, right? The scariest part was probably driving down US 60 to Sikeston hearing about the horrible weather around us in Jackson, Mo., and elsewhere. There was flooding on US 60, which we took on Wednesday night. It was literally lapping at the shoulder of the road. Much of this is farmland. 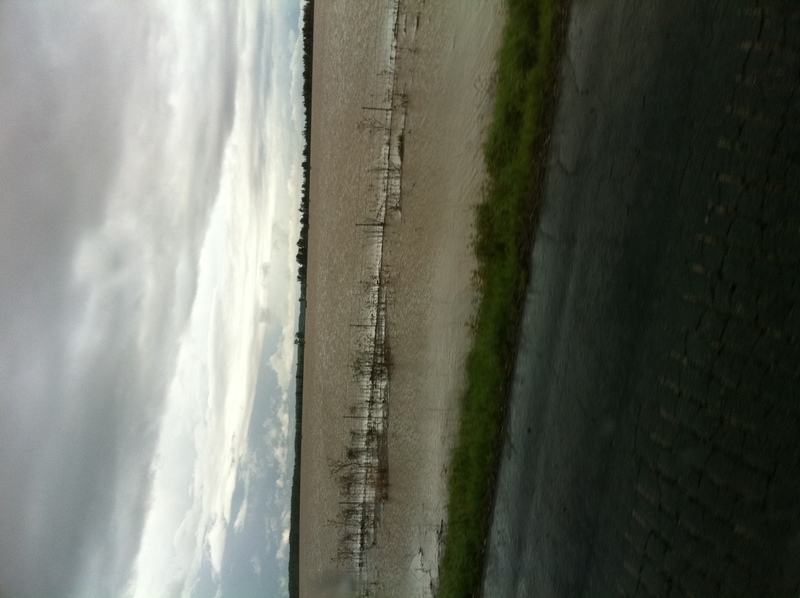 Thursday morning the ramp from Sikeston to I-55 to St. Louis was also partially under water. 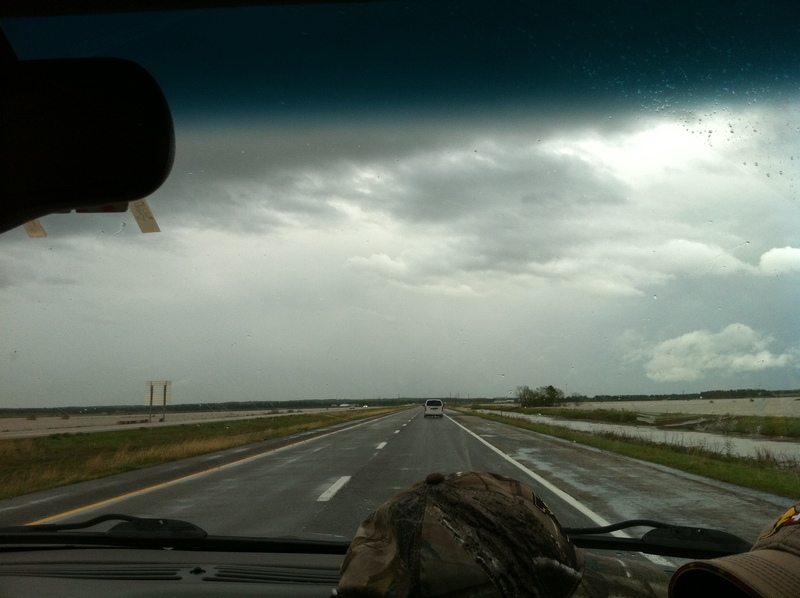 The farther NE we drove, the worse the flooding was. It literally looked like we were driving through an ocean. About this time, we are told that we will be staying in Sikeston over night because of weather and closed roads. Oy. Our hectic day calmed a bit at that point. We were able to find the unit from Columbia at their Armory base in Sikeston and we settled in to interview the soldiers about their experiences thus far. The Columbia troops were mainly administrators, but one said he had never see flooding this bad before in his other deployments. I can’t say enough about how helpful the Guard was throughout our whole trip. Their spokeswoman and information officers were always more than happy to talk to us and keep us informed. Both once studied journalism at MU, so we can all be happy the Mizzou Mafia is alive and well. Drew and I were completely wiped out when we got a hotel and started to write this story. It was 6:30 p.m. and our deadline was at 8:30 p.m. We spent about 30 minutes freaking out and struggling to gather our notes/thoughts/minds. Then we wrote. About 2.5 hours later we cobbled together a story. It was long, but full of quotes and stories. We were both pretty pleased. We sent it to my editor and breathed a huge sigh of relief. We got the edited copy back a short while later, and though I had some disagreements with what was cut and added, we were glad we could just be done for the night. Worst part? We went without dinner. Before you judge our bad timing, remember: we are used to a college town where pizza delivery makes most of its money after midnight. In Sikeston, Pizza Hut closed at 9 p.m. That’s right. 9 p.m. At that point, we just decided to call it quits and collapse into sleep. We were back up at 6 a.m. the next morning to go follow the Guard on a mission. Once again, I was surprised by how nice they were to us, especially given that we were journalists who just keep asking them questions. Incessantly. The soldiers really were not that much older than us, so it was fun to hear about their lives and joke around. 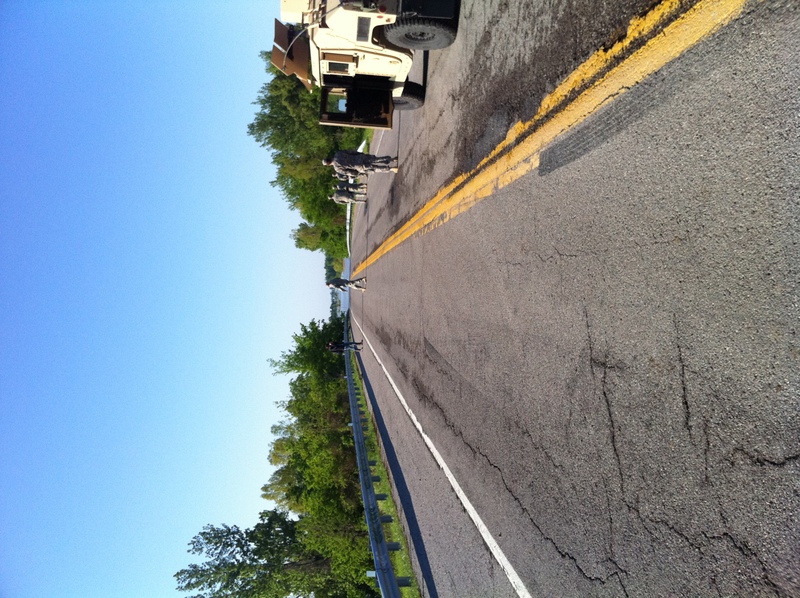 When we packed into the huge military Humvees, I was excited to see the flooding up close. Couldn't get much closer, but in the distance you can see where the water has risen so high it covers the road. It is impassable. 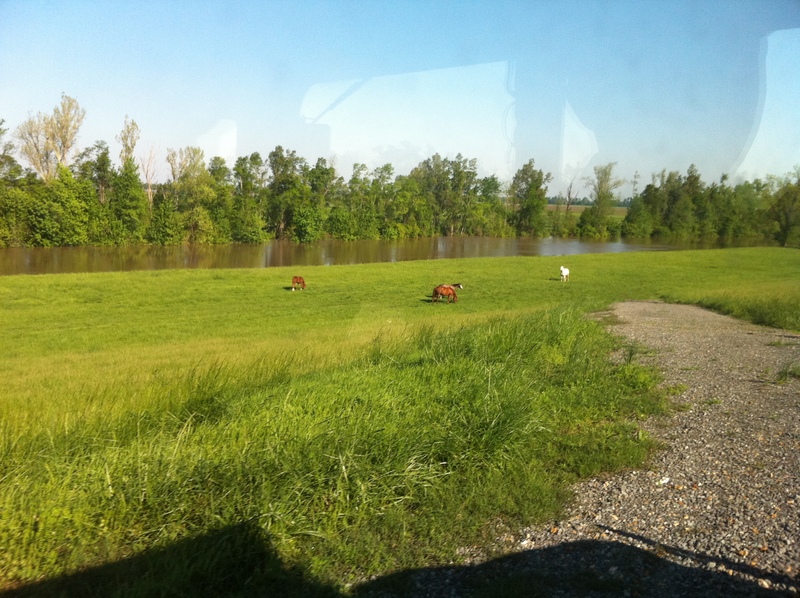 We drove onto a natural levee and watched as the Guards map out checkpoints in areas to keep watch over in case it rains more and the water levels rise higher. It took about an hour, and as we drove through rural Mississippi County, it was very easy to see how saturated the ground was with water. Some parts of the rural roads were in 13-15″ of water, and could be deeper. The Guards did not even attempt to cross the standing water for fear of damaging the engines if it was too deep. After seeing the mission, Drew and I started the drive back to Columbia.